From Victor Frankenstein to Dr. Moreau to Doc Brown in Back to the Future, the scientist has been a puzzling, fascinating, and threatening presence in popular culture. From films we have learned that scientists are either evil maniacal geniuses or bumbling saviors of society. Mad, Bad and Dangerous? puts this dichotomy to the test, offering a wholly engaging yet not uncritical history of the cinematic portrayal of scientists. Christopher Frayling traces the genealogy of the scientist in film, showing how the scientist has often embodied the predominant anxieties of a particular historical moment. The fear of nuclear holocaust in the 1950s gave rise to a rash of radioactive-mutant horror movies, while the possible dangers of cloning and biotechnology in the 1990s manifested themselves in Jurassic Park. During these eras, the scientist’s actions have been viewed through a lens of fascination and fear. In the past few decades, with increased public awareness of environmental issues and of the impact of technology on nature, the scientist has been transformed once again—into a villainous agent of money-hungry corporate powers. Mad, Bad and Dangerous? also examines biographical depictions of actual scientists, illuminating how they are often portrayed as social misfits willing to sacrifice everything to the interests of science. Drawing on such classic and familiar films as Frankenstein, Metropolis, and The Wizard of Oz, Frayling brings social and film history together to paint a much larger picture of the evolving value of science and technology to society. A fascinating study of American culture and film, Mad, Bad and Dangerous? resurrects the scientists of late night movies and drive-in theaters and gives them new life as cultural talismans. "An adroit review of past studies of images of science combined with his own reading of films, with contributions from a radio series. . . . Pretty comprehensive." "Splendidly impartial account of how scientists have been portrayed, and he must have spent many days watching films of all kinds. . . . This most entertaining book has wide appeal. The illustrations have been carefully selected, and there is a long list of references. Above all it has been meticulously researched." "He covers films from the first half of the twentieth century rigorously, detailing lost or forgotten reels with the precision and loving hand of a devoted film historian. . . . Frayling has certainly done his homework, and Mad, Bad and Dangerous is bulging with factoids." "Certainly rings true. . . . Generally lively and entertaining writing style. . .Frayling gives us valuable insights about a very real problem." "Thorough and interesting . . . points to the importance of educating viewers to recognize the manipulation inherent in any movie." 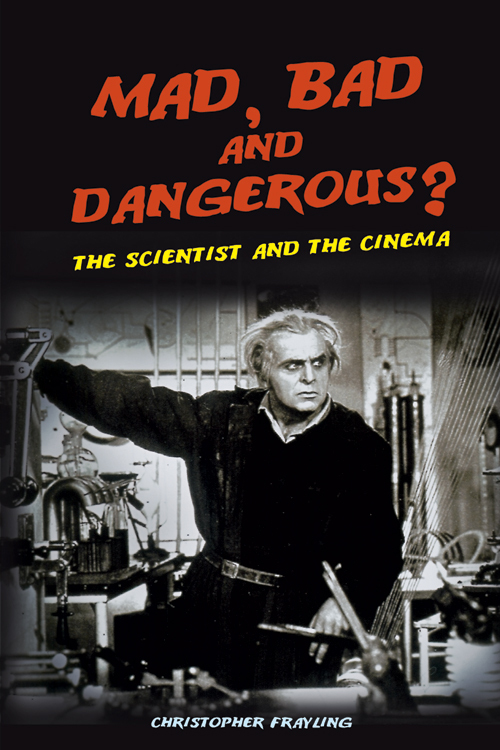 "The portrayal of the scientist has been a particularly potent one in cinema, from Fritz Lang’s wild haired Rotwang in Metropolis to the evil Dr Strangelove. . . . Frayling ponders the influence of this belligerence in the real world in this excellent and witty analysis." "Charming and fun to read. . . . Frayling writes from an erudite, but lively, historical perspective, focusing on the first half of hte 20th century." "Frayling’s great strengths as a cultural historians are inclusivity and wry wit. He retains a schoolboy enthusiasm for stinks and whizz-bangs and bug-eyed monsters, but knows exactly where these tropes come from and is willing to consider all their uses and meanings."